This Sunday, Palm Sunday, commemorates the entrance of Christ into Jerusalem. When the crowds laid palms on the ground before him as he triumphantly entered the city. What a contrast it must have been, when just days later Christ was betrayed, condemned to death, mocked, scourged, and executed as a criminal. In preparation for the celebration of Palm Sunday, Robbie Renner, diocesan seminarian and UMW Alumnus (‘16), wrote for us a reflection on Sunday’s Gospel. On Palm Sunday we get to participate in the reading of the Gospel. This is the long dialogue narrating the Passion of our Lord from the Passover to the burial. We, the congregation, say some harsh words, really condemning words. We shout, “Crucify Him,” and in other Gospels accounts the people also shout, “Let His blood be upon us.” We participate in the proclamation of the Good News by condemning an innocent man, the innocent one who’s blood did fall upon us. To those that shouted at Him and think this man does nothing for us, saying “Thank You” would be off the table. But God loves irony. He likes to turn things around. Whether it is making the blind see or bringing someone from unbelief to belief, God loves to make an unexpected change. On Palm Sunday in our participation of the proclamation of the Gospel we speak words of condemnation, yet inwardly recognize our need to repent, a last ditch effort at the end of Lent. By our participation in the the Blood of the innocent one that was meant to show our responsibility for His death, we receive everlasting life. He converts us and let’s us continues to let us participate. We first participated with sin, and now we can participate with thanks. This week we celebrate the Paschal Triduum, the most important time of the Church’s liturgical year. Beginning Holy Thursday and continuing through Good Friday, Holy Saturday, and Easter Sunday, Catholics remember the Paschal Mystery of Christ’s passion, death, and resurrection. 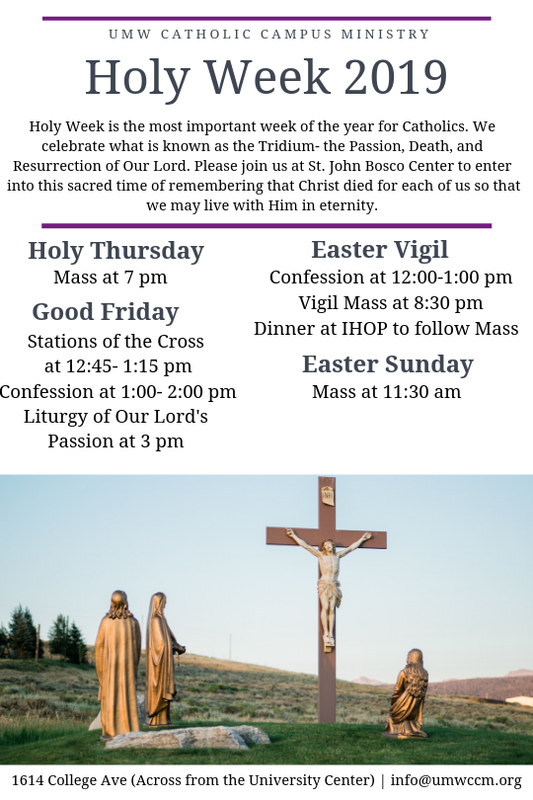 We invite all students to join us throughout this week for our liturgies celebrating the Sacred Paschal Triduum. Need a break from studying for finals? Join us tonight at 7:30 pm in Lee Hall Room 411 for the LAST SUNDAY TALK OF THE SEMESTER! We will be reviewing the major concepts that we talked about this semester and answer any last-minute questions. After the talk join us for the last McDonald’s trip of the semester for food and fellowship.